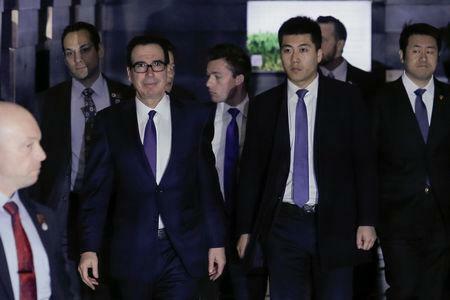 WASHINGTON/BEIJING (Reuters) - The Trump administration's top two negotiators in trade talks with China will meet on Friday with Chinese President Xi Jinping, but there has been no decision to extend a March 1 U.S. deadline for a deal, White House economic adviser Larry Kudlow said on Thursday. "The vibe in Beijing is good," Kudlow told Fox News Channel of the U.S.-China talks that are set to conclude on Friday in Beijing. But Kudlow's upbeat assessment contrasted with reports from two people familiar with the talks, who said progress has been difficult on the thorniest issues involving U.S. demands that China make sweeping changes to curb forced technology transfers and to enforce intellectual property rights. Although U.S. President Donald Trump said earlier this week that an extension of the deadline was possible if a "real deal" was close, Kudlow, director of the National Economic Council, said the White House had made no such decision. China proposed in the talks this week to increase purchases of U.S. semiconductors to $200 billion over six years as part of a deal to ease American tariffs, a person briefed on the talks told Reuters. But the semiconductor proposal, first reported by the Wall Street Journal, was part of a "recycled" package of goods purchase offers that Beijing first presented in the spring of 2018, the source said. Trump told reporters on Wednesday that the negotiations had been progressing "very well." Hu Xijin, editor-in-chief of China's nationalist Global Times tabloid, also tweeted that speculation on an extension was "inaccurate," citing a source close to the talks. Chinese Commerce Ministry spokesman Gao Feng told reporters he had no information on the trade talks' progress. Trump has said he did not expect to meet with Xi before March 1, but White House spokeswoman Sarah Sanders has raised the possibility of a meeting between the leaders at the president's Mar-a-Lago retreat in Florida. Chinese Foreign Ministry spokeswoman Hua Chunying said she noted Trump had said many times he wished to meet with Xi, and that China was willing to maintain "close contact" with the U.S. side, but said she had no information to share on any visit by the Chinese president.